It used to be that every farm had at least a small forge and an anvil so the farmer could repair his equipment and make his own tools and hardware. We continue that tradition here at Elkhorn with a small “smithy” (blacksmith shop) in the barn and it comes in very handy, especially for repairs. Last week, I had a critical mass of items that needed fixing on the farm, so I fired up the forge and set to fixing the things I’d broken. The first item was a broken hay hook. 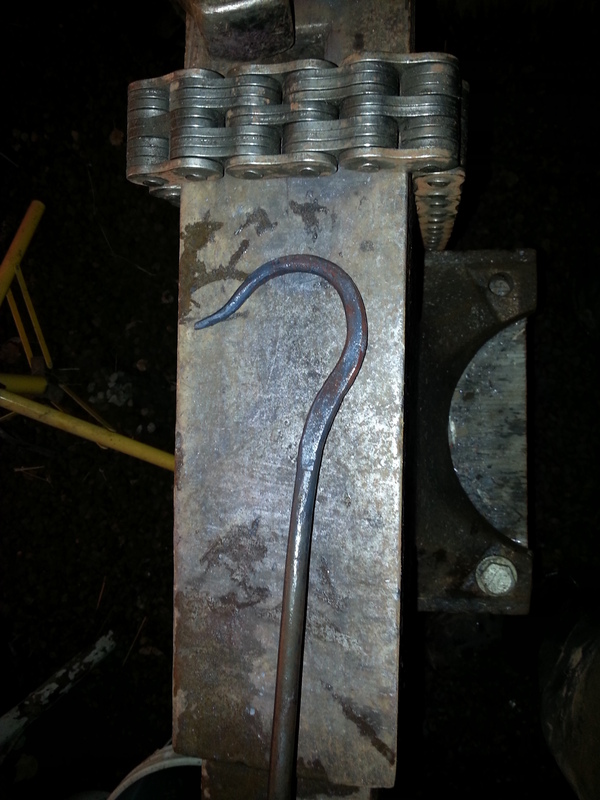 I’d forged the hook some months earlier out of mild steel, but I was in a hurry and didn’t temper it, leaving the metal hard, but also brittle. Tempering is a heat treatment that involves slowly reheating the metal and then quickly cooling it by quenching in liquid. We think of tempering as adding toughness to the metal. 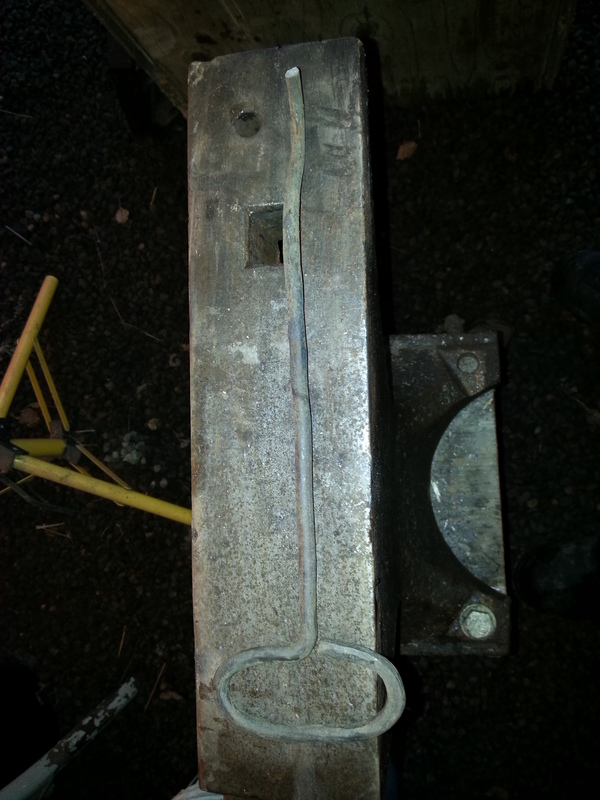 In this case, I just forged the hay hook and cooled it by plunging it into water. Over time, the hook bent repeatedly and finally broke off. 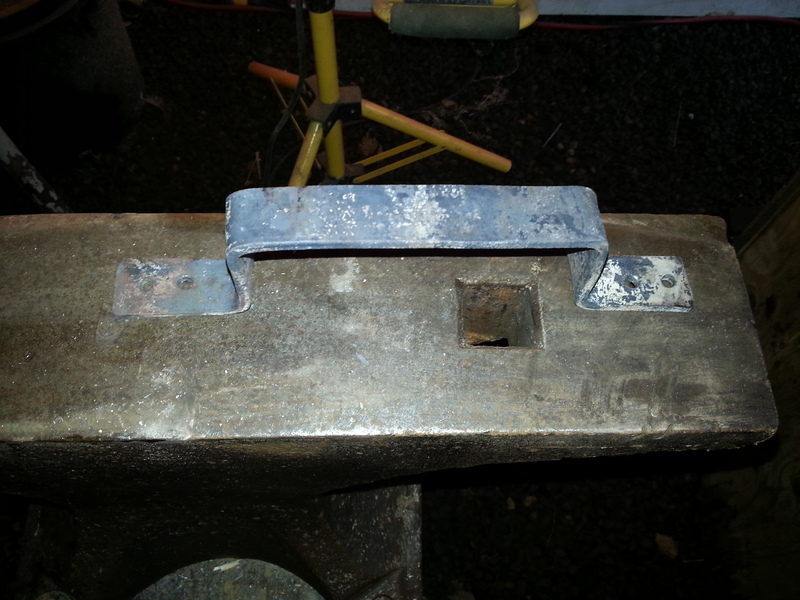 Instead of running to the feed store and shelling out $10+ for a new one, I heated and reshaped the broken hook with a hammer and anvil. It’s a little shorter than it started out, but works just fine. And of course, I was in a hurry again and didn’t temper it, but that’s okay. Tempering can happen any time and doesn’t have to occur when the object is forged. The second item I needed to fix was a tow hook. I forged a bunch of these and attached them to feeders, waterers, and shelters with deck screws so I can tow them around the farm. This one got torn off when a shelter decided it didn’t want to move after all. This is an example of a hand-forged item that is easy to make, but would be difficult to buy. You won’t find this at Home Depot. Rather than throw it away, I reheated it, and hammered it back into shape. 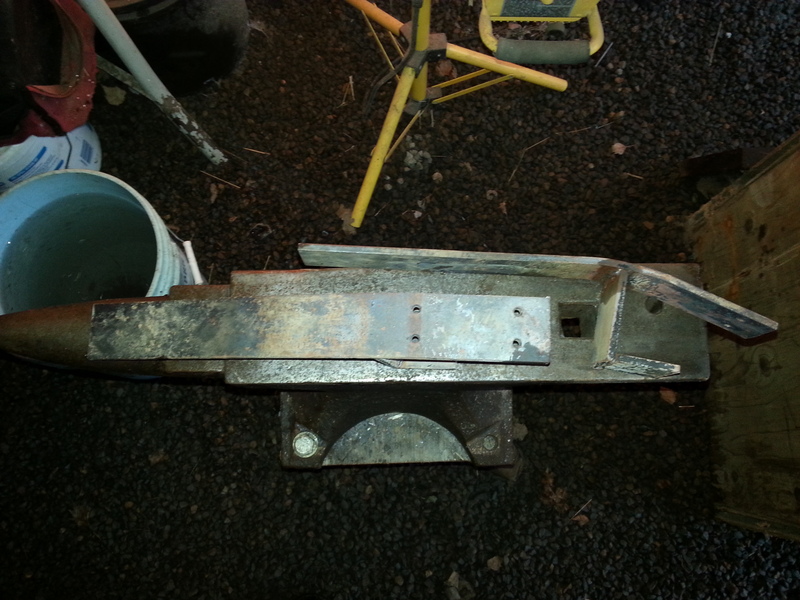 The last item that needed fixing was a homemade bracket that screws onto a board that I use as a loading ramp for my ATV. The bracket was originally flat, but I decided it needed a slight bend. 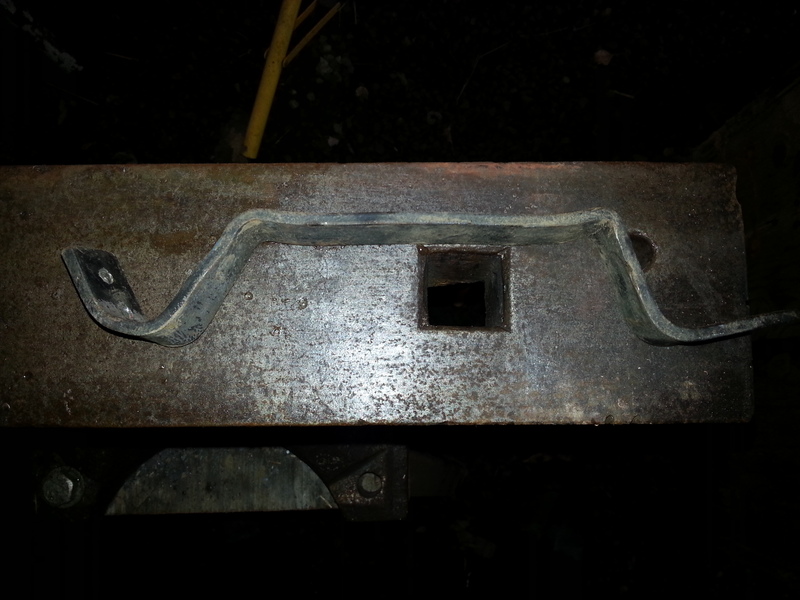 Since the forge was already hot, I heated up the bracket and added a bend using a simple bending jig in a vice. Fast and easy. Having a forge on the farm is very handy and a lot of fun. I get to mess with fire and beat on metal with a hammer, how could I not love it? 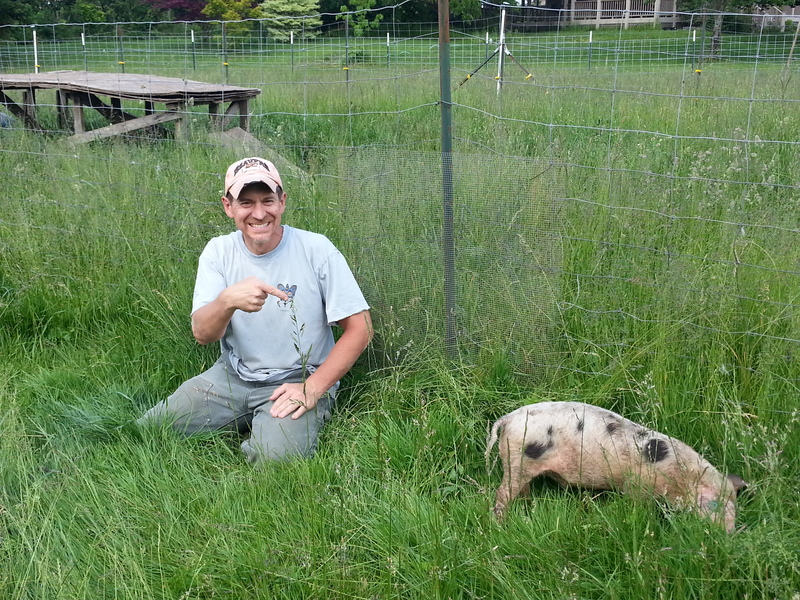 My name is Matt Alford and I am a small-time pig farmer located in the unincorporated community of Laurelwood, Oregon, about five miles from Gaston and 50 minutes from Portland. 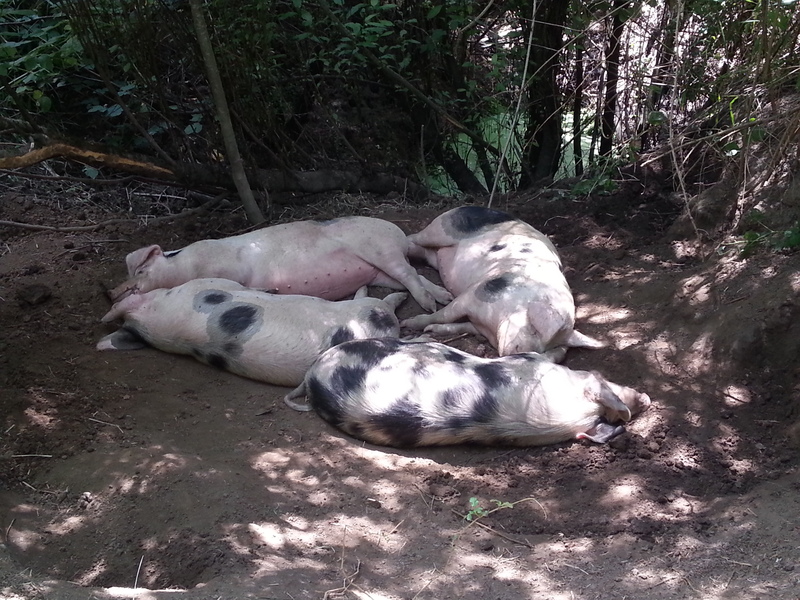 I raise Gloucestershire Old Spot heritage hogs and sell them farm-direct to local eaters, who appreciate the high quality of the meat and the extensive effort that I put into making sure the hogs live the very best life possible. People who know me, know that I have a very high bar for the meat that I put on my own table. About fifteen years ago, I quit eating meat entirely after learning what “factory farming” meant. I wanted nothing to do with that and I spent the next two years thinking about life, death, right, wrong, meat, murder, capital punishment, religion, hunting and all sorts of other tangents related to meat. I finally came to the conclusion that eating meat isn’t wrong and whatever meat I consume, I’m going to know that meat from field to table. I also decided to confront the fact that meat comes from a living, breathing being that thinks for itself and feels pain. Meat nourishes life by taking life and at the very least, I owed the animal the respect of looking it in the eye and taking its life myself if I thought eating meat was so important that the animal needed to die in order to feed me. As a result, I learned how to hunt, first with bow and arrow, then later with rifle and shotgun. I learned what it meant to hunt animals in the wild, on their own terms and what it meant to eat a lot of salad after coming home empty-handed. I spent days and weeks sitting quietly in the woods, watching animals interact with each other, care for their young, and live in freedom. I learned humility and respect for every piece of meat I brought home for the table. 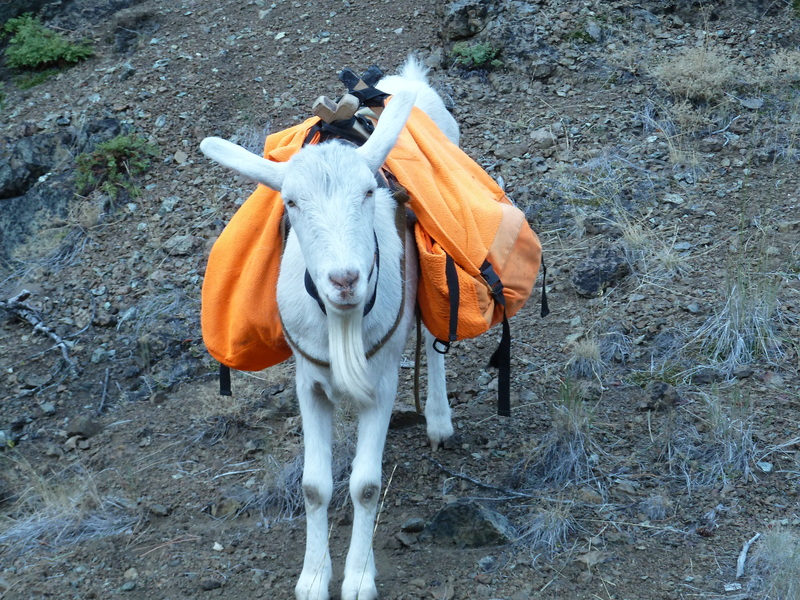 Eventually, I started raising packgoats to help me carry my camp into the backcountry and the meat back out to the truck. I was a slow learner, but my goats were kind enough to teach me lessons over and over about what it meant to put up a fence and keep it up. They also made sure I understood that they viewed anything I built as a temporary structure and they were put on this earth to see to it that temporary structures were torn down. After about seven years of “goat learning” I decided to raise a couple weaner pigs for my own consumption. I already had good fences, water, and pasture. While I expected the final pork would taste great (and it did), what I didn’t expect was to like being around pigs as much as I did. Pigs are funny. They chase each other around, root in the dirt, and like to come over and investigate whatever I’m doing. Now, my farm doesn’t feel complete without them. I like pigs and I’m happy raising them in a manner that supports their “pigness” and happiness. It seems that other people like it too because wherever I go and talk to people about how and why I raise pigs, there is someone who asks if they can buy pork from me. That makes me happy, because every pig that I sell reduces the demand on factory pig farms. Maybe someday, enough people will buy local, pasture-raised pigs that there won’t be any demand for factory farms and they will just become a shameful foot note in our history. 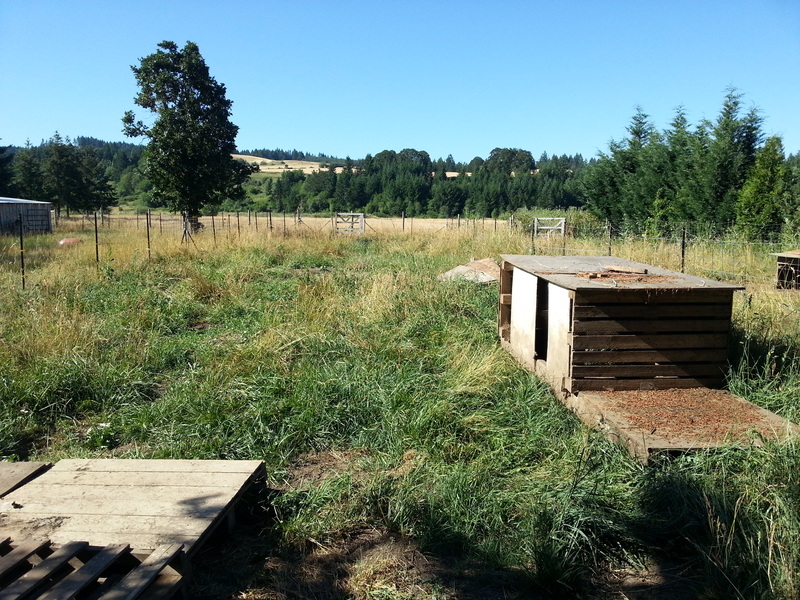 Industrial pig farming hasn’t been kind to pigs and they deserve better. I’m doing my part, a few pigs at a time.